Commercial peat extraction began with the development of the railway network in the late 19th century in central Scotland. Peat was extracted from readily accessible peat moorland for use by horticulturalists and fuel merchants, leaving serried ranks of neat rectangular trenches. Today, rough tracks leading to large areas of regular parallel strips of cleared ground, without any vegetation, characterise this land use. However, over the past 20 years commercial extraction has decreased, for environmental reasons. Many areas have been abandoned, leaving behind old machinery and other evidence of the workings. Gradually nature is subsuming these features back into the moorland. 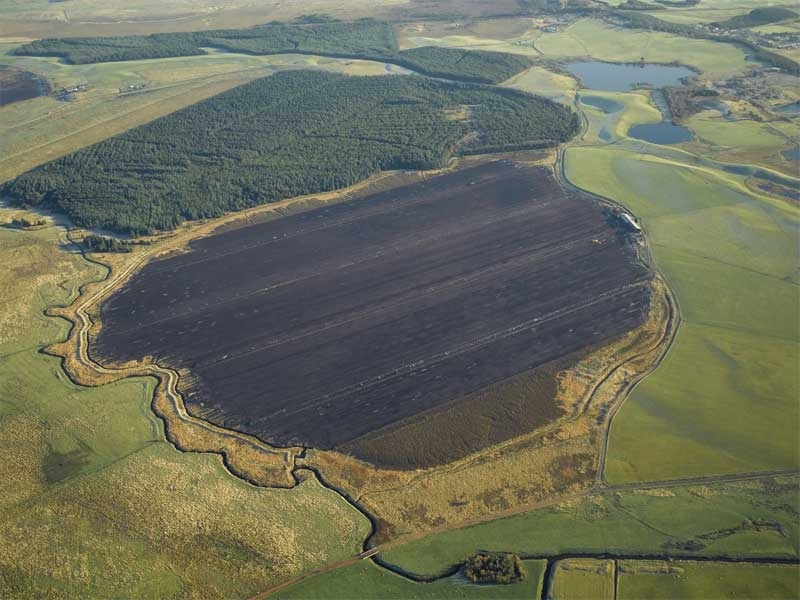 The commercial peat extraction at Ryeflat Moss, South Lanarkshire, has created a landscape of brown stripes as the machine stripping of the peat progresses. It is a land use that is identified using aerial photographs.